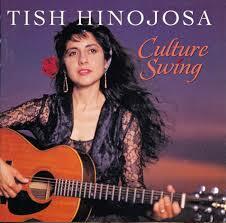 There are very few of what I consider as near "perfect" albums, but "Culture Swing" by Tish Hinojosa has to be one of them in my book. I guess I consider myself at least a little bit knowledgeable when it comes to folk music, since I came out of the folk music revival of the late 1950s and 1960s, traveling this country with some of the best singer-songwriters and players of my generation (Dylan, Perry Lederman, etc. ), and hanging with and getting to know folks like Joan Baez, the New Lost City Ramblers, The Country Gentleman, Jack Elliot, and so on. I may not be an expert, but I do know talent when I hear it. Tish Hinojosa has that. She writes and sings beautiful songs. Good songwriters are very hard to find. Hinojosa is a child of Mexican immigrants, the youngest of thirteen children; she records in both English and Spanish. Tish Hinojosa is as fresh and bright as any of the better-known artists and, to my taste, way more humble and close to the heart. In other words, I love this music. I have seen Hinojosa in person, I believe, three times, and each performance was stunning. I was struck with the openness, humility, and beauty of her soul and work. Tish Hinojosa is indeed a rare bird.